In the 1970s, geologists became aware that the Taoudeni basin possesses considerable quantities of gas and liquid petroleum resembling the petroleum-rich provinces in Algeria, Niger, Sudan, and Libya, yet during the following three decades, it remained a ‘last extraction frontier,’ largely unexplored. During one of his numerous visits to the region, the former leader of Libya, Mouammar Kadhafi pronounced this premonition for the Mali’s Sahel-Sahara region, including the Taoudeni Bassin: “The North of Mali is very rich in mineral resources. If you don’t take care, one day the West will come and install themselves permanently in order to exploit your resources.” (Maïga 2015). The Taoudeni Basin is now being divided and explored. This process has entailed a new phase of exploration from multiple international companies, a reframing of national policies, and increasing insecurity resulting in the militarization of the region. Beginning in 2004 the Government of Mali (GOM) under president Amadou Toumani Touré (ATT) began hastening down the pathway towards becoming a member of Africa’s petroleum club, by adopting a new law related to petroleum (LAW No 04-037 / of August 2004), which established the organization of, exploration for, exploitation of, and refining of hydrocarbons. Along with this, nearly 700,000 km2 of land divided into 29 blocks across five sedimentary basins have been marked out across the basin, and these were offered as shared concessions between the national government and foreign petroleum companies. Australian company Baraka Petroleum Limited was the first to sign an agreement with Mali’s national company for petroleum research and exploration (AUREP) and began geologic and seismic testing in 2005, igniting the petroleum rush to Mali and prompting others to explore. In 2011, Total, having engaged in the Mauritanian side of the basin declared, along with their Algerian partners Sonatrach, that the ‘important discoveries were the El Dorado of petroleum reserves’ (Le Post 2011). In 2015, the U.S Geological Survey estimated undiscovered and technically recoverable average resources to be the equivalent of 160 million barrels of conventional oil, 1,880 billion cubic feet of conventional gas, 602 million barrels of shale oil, and 6,395 billion cubic feet of shale gas in the Taoudeni Basin Province in both Mali and Mauritania (Brownfield et al. 2016). The Kel Tamashaq or Tuareg, a nation of people spread across Mauritania, Mali, Niger, Libya, and Algeria have been one of the key groups from the region standing up to the massive sell-off of the region’s natural resources. Their struggle is framed within demands for an autonomous state stretching between Niger and Mali, which has been pursued through five significant rebellion movements since especially the post-colonial period and has resulted in brutal suppression tactics on the part of Malian and Nigerian military. During the 2007 so-called ‘uranium rebellion,’ Tuareg rebels took up arms closely after the Niger government released of 50 mining allotments to extract uranium and the Mali government began a new phase of oil exploration. Niger’s military used heavy violence upon the Tuareg people, causing some to accuse them of ethnocide (Keenan 2008). Resulting from Ghaddafi’s downfall in Libya, the National Movement for the Liberation of the Azawad (MNLA) captured munitions and returned to northern Mali to establish the Azawad state in 2012. During the 2012 Malian Civil War between the Mouvement Nationale pour la Liberation de l’Azawad (MNLA) and the Malian military, the initial temporary complicity of the rebel movement with jihadist-identified group Ansar Addine and Tuareg leader Iyad Ag Aghaly mistakenly conflated the MNLA’s cause with that of jihadist terrorism. As the jihadist-led militias moved further south into Mali, France, in a unilateral sweep, initiated French military intervention SERVAL to suppress the fighters into retreat. Consequentially, the UN installed a peacekeeping force that is still controlling the region today and France has established its indefinite military mission BARKHANE with 6,000 French troops across the region to suppress terrorist activities. BARKHANE will be joined by both an American drone base in northern Niger, a UN-sponsored regional force, and a fully weaponized Malian army. Prior to the signing of the Algers Peace Accords in June 2015, the written demands of the Coordination for the Azawad Movement (CMA, which includes the MNLA and other groups with similar interests) included a motivation that the development of energy and mineral resources be submitted to regional authorization prior to passing to approval in the National Assembly and that 20% of the production would belong to the Azawad (specifically to the source region in the Azawad, see ‘CMA’s conditions’). These demands were not met. The oil exploration juxtaposed with the semi-permanent militarization of the Sahel-Sahara Region have lead some analysts to suggest that the struggle to exploit Taoudeni depends upon continued Saharan instability (Studer 2017; Keenan 2010; Bainafouna 2012). With the kidnapping of 32 tourists in Algeria in March 2003, the United States began AFRICOM as part of George Bush’s Global War on Terror (GWOT) and what it called the ‘second GWOT front’ in Africa. In January 2004, 500 US troops were installed in Mauritania, which followed with an expansion of a nine-country Trans-Saharan Counter Terrorism Initiative (TSCTI). Jeremy Keenan, an anthropologist at the School of Oriental and African Studies at University of London pointed to the collusion between the United States and Algeria in what he calls “this newly fabricated front in the Global War on Terror, [which] helped create the ideological conditions for Washington’s militarization of Africa” (2008: 17). Yet, as shown by a recent article in Libération, militarization has not lessened the terrorist activities, instead they have grown in frequency and magnitude (Chelbi 2017). As stated by Catherine Besteman, “Through AFRICOM’s military assistance to African governments, the Unites States will have an even stronger voice in shaping domestic laws and policies regarding terrorism and resource extraction in African cities, as well as greater influence over the ability of African governments to formulate independent foreign policy and support the rights of those considered terrorists by the United States” (2008:20). “Everyone is surrounding our territory. There is a war for the mineral resources. France went ahead in order to obligate Mali to sign a defense agreement and thereafter grant mineral concessions and protect those that already exist. That is the essence of this war.” (Hama Ag Mahmoud, Foreign Affairs Minister for the Transition Council of the Azawad State). Project Details The Taoudeni Basin, spanning from the southern edge of Algeria through northwestern Mali and across Mauritania is one of the main structural units of the West African Craton and the largest sedimentary basin in Africa with an area of approximately two million square kilometers and 5,000 meters thick. Originally, the name stems from the town Taoudenit, a site where salt excavation and trade has persisted since 16th Century. Along with salt, the basin possesses gold, phosphate, natural gas, petroleum, and water, held within what used to be an ancient sea of fresh water. Climate in Taoudeni is extremely harsh, with temperatures climbing to 40 or 48 degrees Celsius during the hottest time of the year. Even with the country barely prepared to elect a new president after the coup d’etat in 2012, leaders in Mali affirmed the importance of pulling in investment as an important step in securing peace and stability in northern Mali and the broader region (Oumar 2013). And, bringing in this investment requires a certain level of security. Ould Habib, political analyst from Mauritania stated, “[p]erhaps the Malien government understood that by bringing in the international coalition against terrorism, that there was an opportunity to bring in investment to the zone, and once the security is established and the military maintains the peace, supported by the West, who have installed themselves in the area.” (ibid.) The “opportunity of the war against terrorism” is thus to push forward a route towards development, build the economy around extractives, and, presumably reduce the chaos currently dominating the country (Kabada Ould Abdelrahman, quoted in Oumar 2013). Since this petroleum push at the turn of the Century, multiple international companies have purchased, sold, and repurchased holdings in the Taoudeni basin. While shifting regional security has produced changes in the makeup of holdings over time, there are over 15 companies currently or in the past who have held exploration contracts, and only one with an exploitation contract. In Mali, foreign investors include: Baraka Energy and Resources Limited (Australia), Sonatrach (Algeria), New Catalyst (USA), Heritage Oil (Canada), Circle Oil PLC (Ireland), Raven Resource Group (UEA), Selier Energy (Canada), Sphere Investments Ltd. (Canada), Markmore Group (Malaysia), Simba Energy (Canada), Statoil (Norway), African Oil Corporation (Canada). In Mauritania, foreign investors are: Total (France), Repsol (Spain), Qatar Petroleum (Qatar). All of these companies have current or had past holdings in the basin. While exploration has not yet translated to extraction, there have been several wells drilled on seismic testing in the blocks that have been sold. The Mali Peace Accords were signed in January of 2015. Moreover, since the signing of the Peace Accords, administrative units have been established in the newly established Taoudeni region. More recently with the visits of Economy Minister and later President Emmanuel Macron to Mali, the European Union invested 50 million euros (55.8 million dollars) in the war against terror. and Macron called upon the United Nations to further fund the efforts to maintain peace and security in this oil-rich region. There are also German troops in the region. In May 19, 2017, Macron's second visit broad as new President abroad was to Mali, in a high level mission. 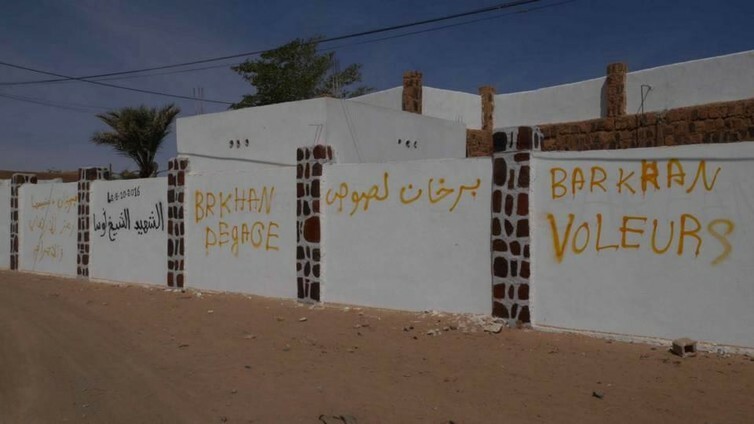 While it appears that the France-Mali securitization strategy will be extended, operation BARKHANE has had little to show for its 3-years of counter-terrorism efforts in the region (Chelbi 2017). As stated by Yvan Guichaoua, “States that accept this foreign presence win credibility externally, but are weakened internally. It creates a quasi-protectorat” (Carayol 2016). Baraka Energy and Resources Limited (Australia): In October 2004, five large exploration permits (Blocks 1, 2, 3, 4, and 9) totaling 193,200 square km (one-third the size of Texas) in northern Mali and two permits (Blocks Ta11 and Ta12, approved in 2007 by the Mauritanian government) covering approximately 60,000 square kilometers were awarded to Baraka (the company changed its name to Baraka Energy and Resources Limited in 2011), a Perth-based company (OGJ 2004). The total area Baraka holds within the total basin is approximately 272,000 km2, a total of 8 blocks. The area extends from the Algerian border in the east across to the Mauritanian border to the west. 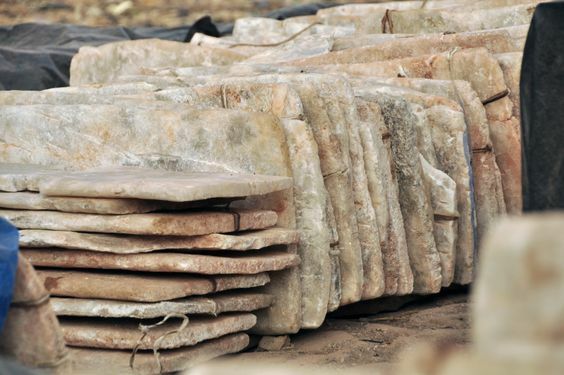 Baraka has undertaken to spend $51 million across all five permits and $4.9 million in the two Mauritanian permits. They hoped to begin exploitation in 2011 to 2014, and sold 50% of their rights to Eni and 25% to Sonatrach in 2006 (Reuters 2013). However, in 2013, just before the French military intervention in Mali, Eni gave up their exploration rights. Sonatrach (Algeria): In 2009, Sonatrach completed promising seismic tests in the basin, and Algeria’s national oil company promised to invest more than $11.5 million in the Taoudeni basin between 2013 and 2017. However, insecurity in the region due to multiple activities including those of Al Qaeda of the Islamic Maghreb (AQIM) caused them to cease operations in January 2013. 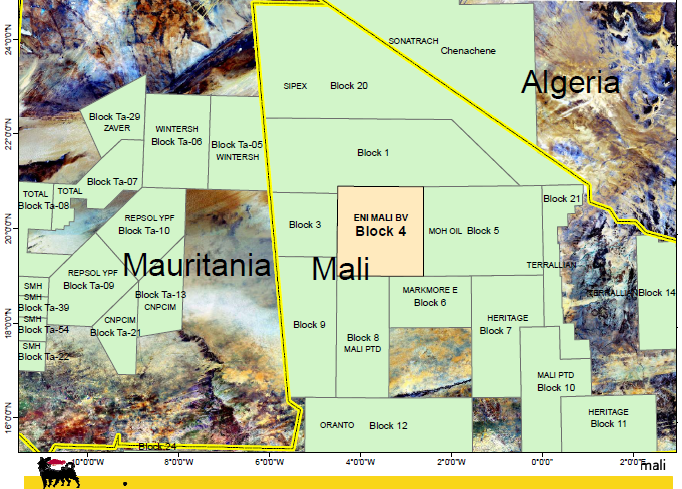 The company resold Block 4 in the Basin to the Government of Mali due to continuing insecurity, and at the end of August 2013, Czech company New Catalyst committed to invest 51.7 million euros (57.7 million dollars) to begin prospecting in the Taoudeni Basin, Block 4. In October 2014, Sonatrach declared that it would return operations to Mali after the signing of the peace accords (in 2015) for the civil war brewing in northern Mali. They have yet to return. 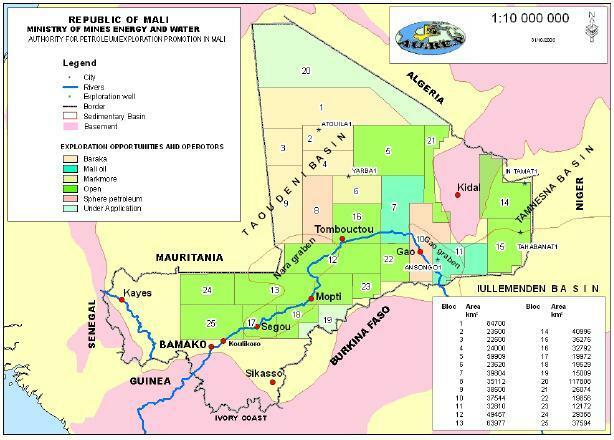 Heritage Oil (Canada): Beginning June 2005, Heritage oil has been awarded Blocks 7 and 11 in Mali’s Taoudeni Basin in partnership with Mali Oil Developments SARL, a subsidiary of Centric Energy. The two licenses cover an area of approximately 72,000 square kilometers in the Gao Graben. Heritage has the right to earn 75% working interest in each of the blocks. A two-year extension has been awarded in January 2009 so that the group may continue with seismic acquisition and reporting to determine drilling areas (centricenergy.com). Circle Oil PLC (Ireland): Also in August 2013, Circle Oil PLC promised nearly 7.7 million euros (8.6 million dollars) to explore in the remaining areas of the Taoudeni, Blocks 21 and 28. Raven Resource Group (UAE): On August 19, 2013, Raven Resource Group obtained an exploration license in the basin for Block 6, in Mali through its subsidiary Corvus Resources Management Limited. It will invest $50 million over a period of seven years. (prnewswire.com). Other holdings: 1) Selier Energy, a Canadian company is interested in Block 18, with an area of 19,259 square kilometers in the Taoudeni Basin and has pledges $11.2 million for explorations. Sphere Investments Ltd., an Australian company is operating in Blocks 8 and 10. Markmore Group, a Malasian company has in the past applied for Blocks 5 and 6. Other players that have bought and sold holdings in Taoudeni include: Canadian oil and gas company Simba Energy (Block 3); Africa oil corporation, and Norweigan company Statoil. Development of Alternatives The CMA is interested in seeing investment and funding from the oil production in their zone. Moreover, they wish to have control of how contracts are agreed upon, with much more local input. They do not see an alternative to extracting this oil, at present. Why? Explain briefly. The CMA (Tuareg-led coalition) did not achieve autonomy over their territory and the resources it contains continues, especially due to the mounting threats from multiple jihadist groups upon the stability of the region. There is a continuation of militarization in the zone, which happens together with new investment in Taoudeni. D. Meunier 1980. Le commerce du sel de Taoudeni. Journal des africanistes, Vol 50(2) pp. 133-144. Besteman, C. 2008. Beware of those bearing gifts: An anthropologist's view of AFRICOM. Anthropology Today, Vol 24(5). (Le Post 2011) Le Sahel, nouvel Eldorado de l’or noir ? (Déchainé 2014) La France explore t- elle le bassin pétrolier de Taoudéni ? (Studer 2015) Mali : la stratégie du chaos pour la main-mise de l’uranium, du gaz et du pétrole ? French Defense Minister Sylvie Goulard, Army Chief of Staff, General Pierre de Villiers, Foreign Minister Jean-Yves le Drian and President Emmanuel Macron visit the troops of Operation Barkhane, France's largest overseas military operation, in Gao, Mali, May 19, 2017. (Studer 2013) Mali : l’armée française pour repousser les groupes islamistes … et défendre les intérêts de Total ? (Maïga 2015) Uranium – pétrole – eau minérale : Les ressources minières du nord pillées ? Manifestation de sympathisants Protest of those sympathizing with the MNLA's cause and who are against all military occupation in the Azawad. 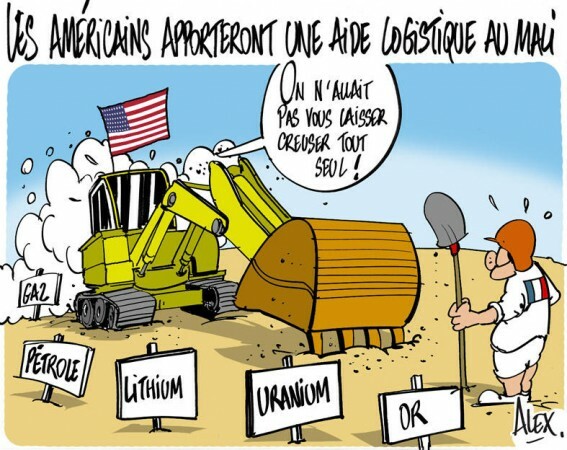 The US supports France's efforts in Mali "We couldn't let you dig alone!" Manifestation de sympathisants Protest of those who are sympathetic to the MNLA's cause and against all militarized occupations in the territory of Azawad. Salt Block of Taoudenit The original commercial enterprise of Taoudenit was the mining and transport of salt. Cut into large blocks, one camel could carry up to 6 blocks to the boats of the Niger river in Tombouctou, where they would continue to the Guinea Coast. The original commercial enterprise of Taoudenit was the mining and transport of salt. 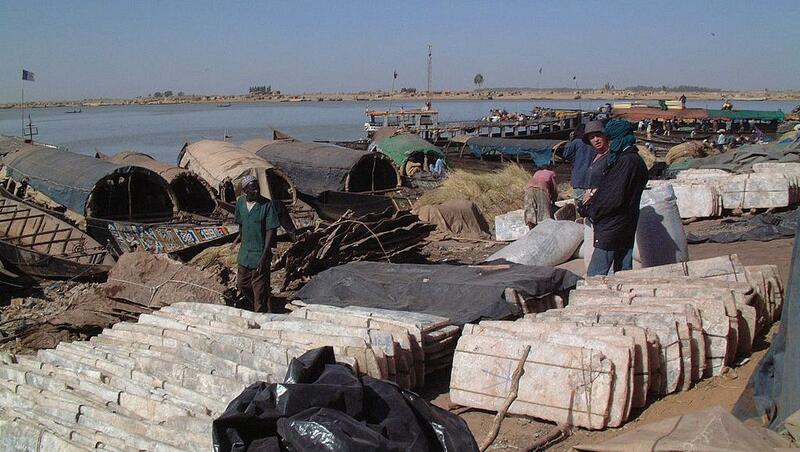 Cut into large blocks, one camel could carry up to 6 blocks to the boats of the Niger river in Tombouctou, where they would continue to the Guinea Coast. "We couldn't let you dig alone!" 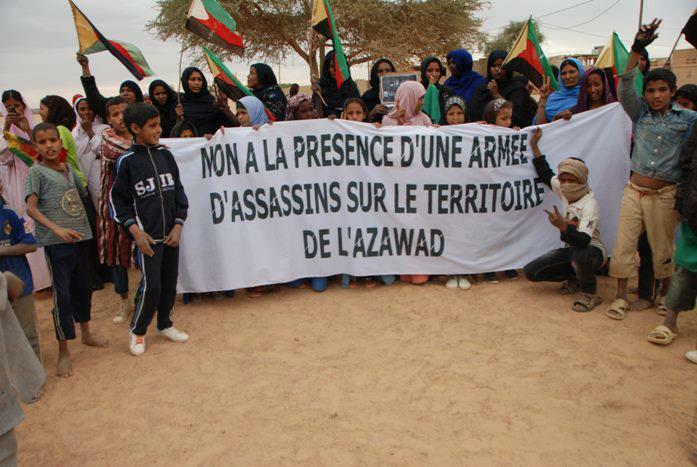 Protest of those sympathizing with the MNLA's cause and who are against all military occupation in the Azawad.